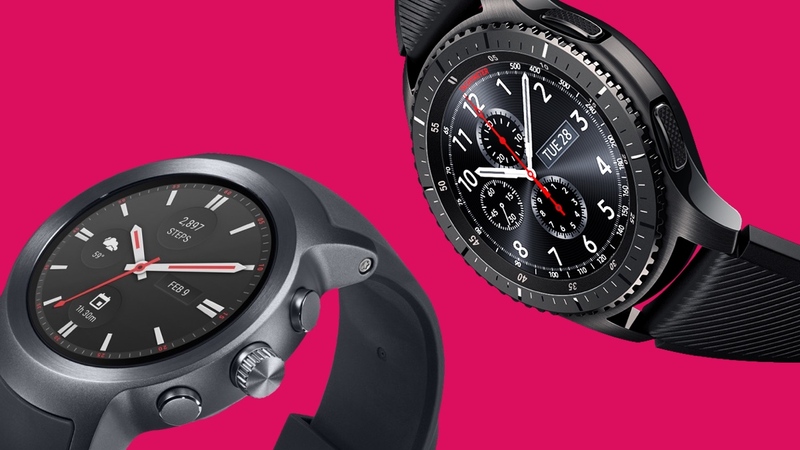 While Fitbit smartwatch details are beginning to emerge and Apple leads the pack, the latest offerings from Samsung and the Android Wear world are still vying for a spot on your wrist. Of all the recent Android Wear 2.0 drops, the LG Watch Sport is the headline act and a perfect device to showcase all of Google's new software exploits. Meanwhile, Samsung also went big and decided to pack in plenty of features into its Gear S3 smartwatch. But which one should see you part with your cash? Well, while we've zeroed in on all the details in our dedicated reviews, read on for our verdict on how these two compare where it really matters. Sometimes you're forced to make a difficult decision when it comes to smartwatch design. In the case of these two, though, you're dealt with pretty much the same conundrum: embrace big or look elsewhere. In the case of the Gear S3, you have either the Classic or Frontier model to choose from — with the latter, as you might imagine, offering a more outdoorsy look. And though the Classic is more suitable to pair with your work attire, both involve hefty frames that are undeniably more masculine than their predecessors. As for the Watch Sport, the model comes in two colour variants — grey titanium and blue — but you'll have to take a look at the stripped back LG Watch Style if you're looking for a slimmer watch compadre. When it comes to screen specs, the Sport offers the best pixel for pixel (348ppi) Wear display so far. Its 1.38-inch P-OLED window and 480 x 480 resolution provides you with a sharp look even on sunny days, though it does have a tendency to pick up smudges at any opportunity. When compared, the two are hard to split. Like its phone displays, Samsung's Gear S3 screen is impressive. And since it's a big 1.3-inch, 360 x 360 AMOLED touchscreen display, there's more screen estate for that Tizen OS to work with. If you're looking for a big difference in design, though, it's how you'll be navigating around the screen. While Samsung decided to stick with its revered rotating bezel to get you around, LG opted to go more traditional and include a digital crown — similar to the Apple Watch. Thankfully, Android Wear supports rotational input, but not everybody will prefer the potentially fiddly nature of the crown in order to take a spin around the OS. And considering both of these smartwatch designs are on the sporty end of the spectrum, durability is likely high on your agenda. Both S3 variants are listed as IP68 certified water resistant, which essentially means you can submerge it in water of up to 1.5 metres for up to 30 minutes but not use it for swimming or diving. And the LG Watch Sport, as you may gather from the theme here, matches it. To represent Tizen or Android Wear 2.0, that's your choice here. The Gear S3 relies on largely the same OS that impressed us on its older sibling, while LG's offering was the first of many to adopt Google's second attempt at its smartwatch OS. Both provide you with a refined experience and ample customisation, but it's worth noting that this is where smartwatch battles are generally won and lost. If you take Tizen's latest iteration, what you'll get is a simple to use OS that runs in sync with the rotating bezel. Notification support is easy to digest despite the odd issue with pulling in images, and provides you with clean options to take your next step after receiving a ding. The app support continues to let down the watch when compared to the big boys, though. Meanwhile, the newly minted Android Wear 2.0 is a huge part of what makes the LG Sport an impressive package. You'll be free to download apps and stream music from the cloud by staying connected to LTE/3G, Bluetooth or Wi-Fi, while standalone apps can work with Google Assistant and without a phone. If you're looking for the smartwatch which can best replace your wallet, the Gear S3 generally beats all comers. Not only does it support NFC systems, but magnetic secure transmission (MST) support is also included, unlike on Android Pay. But when you stack all the cards up, the Android-packing LG Sport edges it here. Like some of its competitors, Samsung has emphasised fitness with its latest smartwatch. There's built-in GPS to track activities like running and cycling, plus a heart rate monitor, barometer and speedometer to tackle the finer points. Automatic exercise recognition works with multiple activities and rep counting helps you keep a check on sets of lunges, crunches, squats and burpees. There are also fitness tracking features to give you a breakdown of steps, elevation and calorie burn, plus it'll give you a vibrating nudge when you've been sitting down too long and not been active. Everything is powered and stored inside the S Health platform, though there's more than enough data that can be viewed from the watch itself. LG also delivers GPS goodness and a heart rate monitor, making it equally equipped to assist you on gallivants around the countryside, detect your strength training movements or clock your work on the treadmill. With regard to the overall platform, Samsung's S Health continues to improve with every software update and feels more complete than Google Fit. With that said, if you're playing the long game and care about the third party fitness app support, it's worth keeping in mind that LG's device is only going to see improvements. While all the above puts these two in the elite smartwatch conversation, it's nothing without the juice to back it up. And since these devices offer relatively similar specs, this could wind up being a deal breaker for you. The LG Watch Sport brings a 430mAh battery to the table, while Samsung's big body allows for a 380mAh pack. This would appear to make it open and shut, but just how quickly this drains away depends on what you have running in the background. LG's offering allows you to experience around a day of continuous use before it needs to rest on the wireless charging cradle — something which, of course, can be stretched out if you aren't making use of the cellular data or GPS. When we've had the Gear S3 Frontier on our wrists, we've managed to squeeze an impressive three or four days of battery from the watch — all while keeping screen brightness pretty high and using the GPS. Neither is blowing away the competition or really emerging as a standout, but what's being offered isn't too bad considering you're unlikely to keep these behemoth wrist companions on during sleep. For those in the US, you can pick up the LG Watch Sport for $349. And while its UK pricing is yet to be confirmed, it's likely to be around the same mark. As far as both models of the Samsung Gear S3 go, you'll also be looking at a £349 hole in your wallet. All in all, these are two models that offer you a fairly similar package. The LG Watch will be found by most to offer the sleeker design, though both manage to fashion an intuitive way to zip around the watch. The most jarring difference between the pair here is the operating system. Android Wear brings more app support, as well as standalone potential and third-party support down the line, though the native fitness features are slightly more polished on Samsung. Ultimately, if you prefer the rotating bezel, Tizen or crave a slightly more efficient battery, you'll likely lean towards one of the Gear S3 models. Generally, though, the LG Watch is a safer bet due to the more friendly nature and bigger app library of Android Wear 2.0.